The weather is starting to get warm and with that comes the urge to start getting your home clean! Spring cleaning is one of the best ways to really shake the winter blues and get ready for spring weather. I love combining cleaning with purging and organizing for a real spring clean feeling. 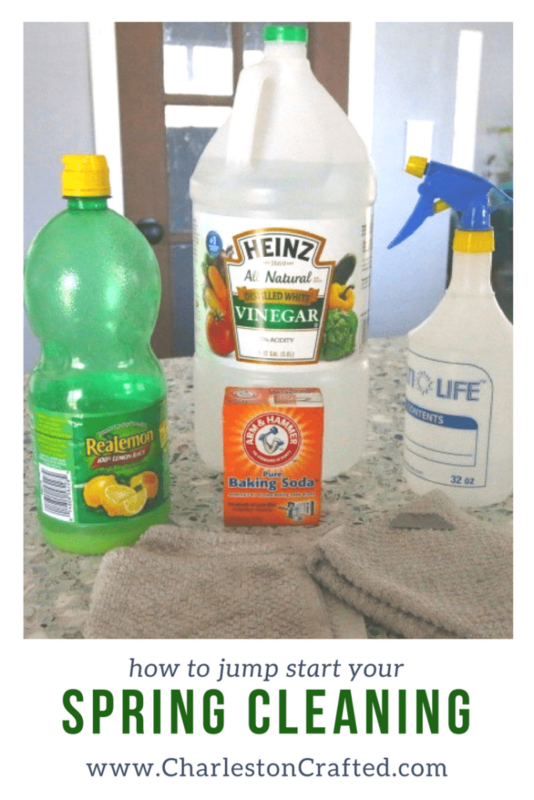 Here are some of my favorite ideas for jump starting your spring cleaning! How to clean your fridge – your refrigerator can accumulate a lot of crumbs and spills. Take five minutes to clean it out! Tackle under your cabinets! Consider building a quick shelf to maximize vertical shape. Clean out your drawers. I love a drawer a day challenge for manageable cleaning! While you’re doing all that purging, be sure to check out my favorite place to donate old towels and linens. Scotchguard all the things – chairs and sofas are obvious, but what about your curtains?! Don’t want to invest in bins? I used old cardboard boxes to organize my craft supplies! Consider adding a simple DIY magnetic board to a wall to corral clutter. Deep clean your appliances. Run the clean cycle on your oven. This is how we clean our electric stove. What is your favorite way to get spring cleaning? !